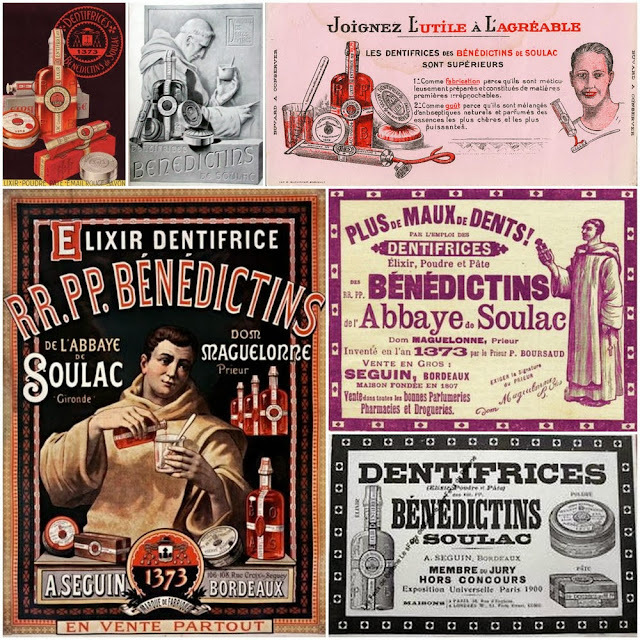 It was Adam over at Invisible Paris who first spotted this 1895 advertisement for a unique range of dental hygiene products: “Dentifrices des RR. PP. 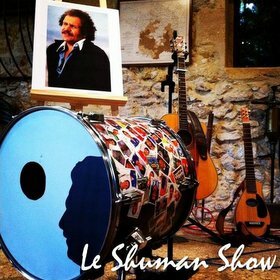 Bénédictins de l’Abbaye de Soulac (Gironde)”. 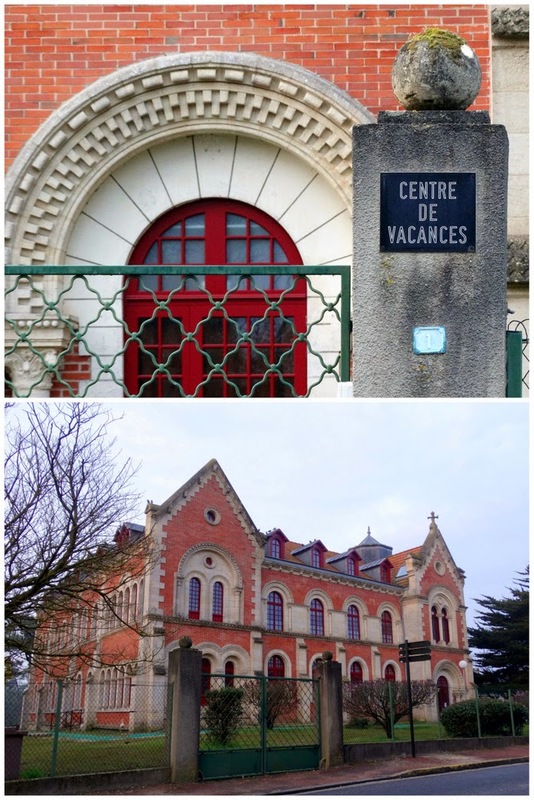 As the distributors, Seguin, were based in Bordeaux, it seemed like a potential subject for this website, but piecing the full story together proved to be a difficult case of working out where the facts end and the work of 19th-century marketing types begins! The undisputed facts are that these tooth care products, which included mouth wash (or, to put it more eloquently, “elixir”), powders and paste, were produced and marketed from the late 19th-century onwards by Seguin, a company founded in 1807 and which specialised in products that were sold in chemists and parfumeries. Seguin was initially based at number 3 Rue Huguerie, near Place Tourny, and later relocated to number 47 Rue Ulysse Gayon, near Barrière Saint-Médard. Seguin's former HQ on Rue Ulysse Gayon. This being a period when personal hygiene was beginning to be taken very seriously, the products proved to be a commercial success, at least until the 1930s by which time Seguin could no longer compete against the likes of Gibbs. The products, the core ingredients of which were the ground bones of cuttlefish, were available in a number of flavours including aniseed, cinnamon and mint, and sold in ornate bottles, tubes and little metal boxes. Much of the success of Seguin’s dental hygiene products can be attributed to the company’s impressive marketing – which is where the lines become a little blurred between reality and myth. 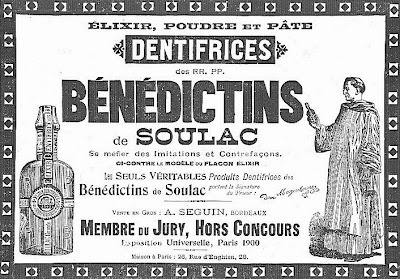 In the countless advertisements that would feature in publications such as “L’Illustration”, the text and visuals would often refer to the supposed inventors of this miracle product, the Benedictine abbots (or “RR.PP”, Révérends Pères) of Soulac Abbey, further up the Atlantic coast, with many references to “Prior Dom Maguelonne” and “Prior Pierre Boursaud”. What, therefore, was the actual sequence of events and who were these holy men? Some of the adverts and marketing materials, including blotting paper (top right). 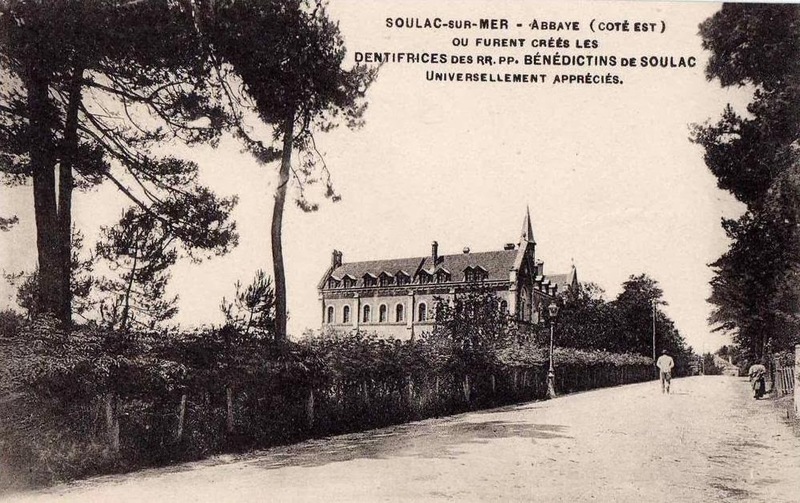 The story goes that Prior Dom Maguelonne, from the “Olivétain” order of Saint Benedict, had been appointed to Soulac-sur-Mer in 1869 to lead, with other monks, the restoration of an ancient basilica, Notre-Dame-de-la-Fin-des-Terres, which had been buried under sand 100 years previously. The recovery operation had been commissioned by the then Archbishop of Bordeaux, Cardinal Donnet, the man we have already encountered on this website as the instigator of Sacré-Coeur parish church and the man behind the installation of the bells in Pey-Berland tower. Donnet also ordered the construction of a new abbey/monastery in this area where a monastery had previously stood from the 12th century onwards. The work proved both difficult and costly, particularly the restoration of the upper structure (entablature) and roof of the old basilica. With more and more people visiting the site (and Soulac at large as the town's seaside resort reputation grew), the sand soil and dunes also needed to be stabilised. Funds would have to be found and were to come from an unusual source. The 1860s abbey/monastery building, which is now a children's holiday home (pictured below). The prior had reportedly been rummaging through the archive documents left by previous generations of monks who had resided on the site before the sand had taken over. And that is where he came across the magical formula for the “elixir” recorded by Prior Boursaud in 1373 (no less) along with Boursaud’s copper seal which authenticated the writings that had been uncovered. Dom Maguelonne’s stroke of genius was to sell the formula to Seguin, who turned it into their flagship product. 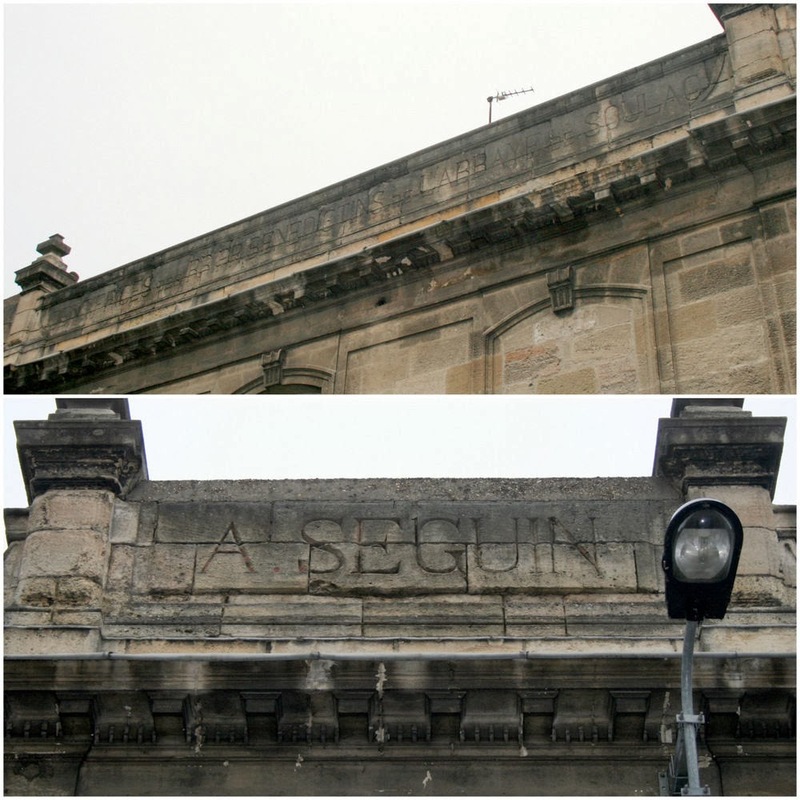 On Rue Ulysse Gayon, the Seguin name remains, as do (see top photo) references to the blessed toothpaste! So, is that really what happened? Or is the truth far less elaborate? According to some reports, in 1885, Seguin simply took up residence in the 19th-century Soulac abbey, installing facilities there within easy reach of the Atlantic beaches and its cuttlefish… and it simply made sound marketing sense to conveniently attribute their dental hygiene produce to the site’s previous tenants! As such, the myth was born and continued to be milked for the next 40 years, with Dom Maguelonne and Pierre Boursaud becoming the faces of Seguin much as George Clooney is now the face of Nespresso! So, as you can see, it’s not easy to draw a line in the Soulac sands between what is true and what is fake in the strange saga of Seguin’s holy toothpaste. The case continues, as will my investigation, and if any hard evidence emerges as to how the story fits together, I promise to edit this article until the definitive account is complete! 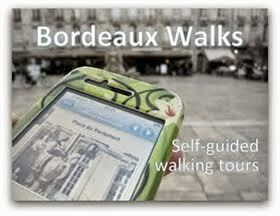 Find them: 3 Rue Huguerie and 47 Rue Ulysse Gayon, Bordeaux.